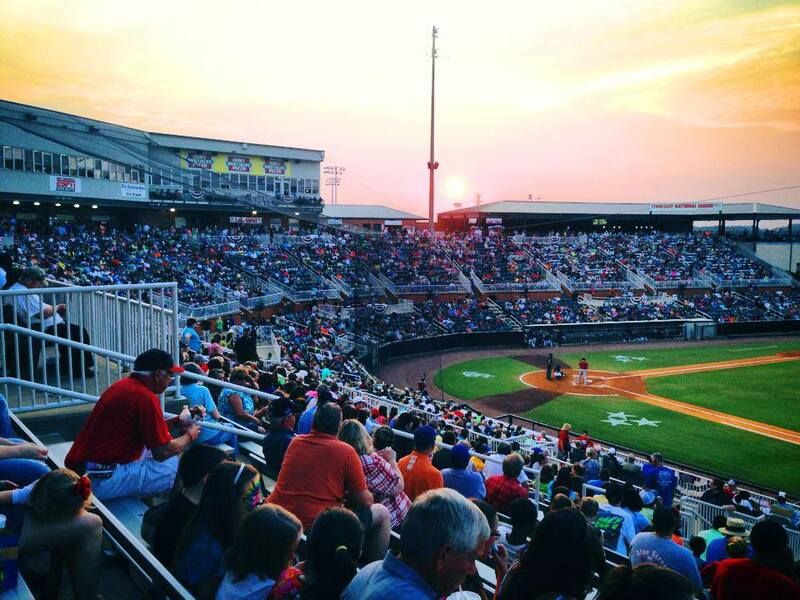 Generals began their final homestand of the season tonight against Chattanooga. 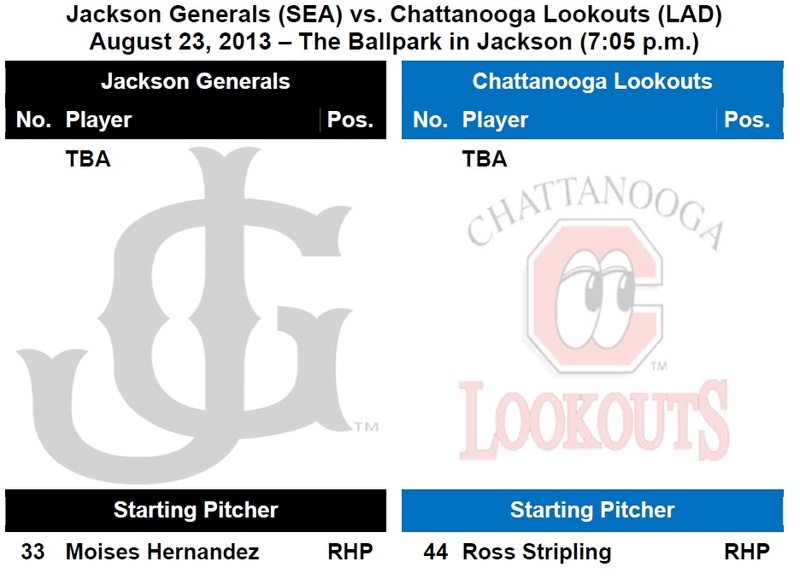 TODAY’S GAME: the Generals begin their final homestand of the season tonight with game #1 of a 5-game series with the Chattanooga Lookouts (0-0)…this season Jackson is 8-7 against the Lookouts and 2-3 at The Ballpark in Jackson…the Generals and BayBears played 7 games during the last 4 days (2-5), which included 53 innings. The two teams played 44 innings in 53 hours Monday-Wednesday…Jackson will wrap up the season with a 5-game series at Huntsville starting next Thursday. GENERALS RECAP: The season-long 7 games in 4 days came to a close in Mobile as the BayBears (33-27) took their 5th straight game over the Jackson Generals (28-31) with a 7-2 win. The Generals had their chances, getting at least 1 runner on base through the first 7 innings, but left 10 runners on base and finished with a 1-for-15 mark with runners in scoring position. Mobile finished the season with a 9-6 record over Jackson. NEWS & NOTES: 44 of 124 games have been 1-run games (18-26) which is the 6th in all of minors…63 of 124 games have been decided by 2-or-fewer runs (23-39) and 16 have been extra-inning games (5-11)…In games decided by 3+ runs the Generals are 32-26. • MOBILE MEGA BOWL BY THE NUMBERS: The Generals played 7 games in 4 days August 19-22 which included 53 innings at Hank Aaron Stadium in Mobile in 77 hours. The first 3 days included 44 innings in 53 hours, 2 extra inning games, 3 1-run games and 14 hours and 37 minutes of game duration. There were 1,442 pitches during those 3 days. The August 20 games were not considered a doubleheader because G1 was the completion of a suspended game from August 6th. • CLOSING TIME: RH Carson Smith since June 21st has made 19 relief outings going 7-for-7 in save oppertunities with a 0.35 ERA in 26 innings, 13 hits, 1 earned run, 39 strikeouts and 10 walks. He has allowed just 1 extra-base hit during that span. • THE RELIEVING MA-SCHEEN: RH Stephen Kohlscheen has allowed only 3 earned runs over his last 26.0 innings (1.04 ERA). During this 14-game stretch (since June 26), he is 5-0 while lowering his season ERA from 3.60 to 2.78. • OFF WITH A BLASH: OF Jabari Blash currently has a 6-game hitting streak and has a hit in 14 of his first 19 Double-A games batting .299 (20×67) with 5 of his 19 hits being home runs. Blash belted a homer in his first Jackson at-bat on August 2 at Mobile…hit 2 home runs vs. Montgomery on August 15. He leads the Mariners farm system with 21 long balls this season. • GRAND SALAMI TIME: Ramon Morla blasted Jackson’s 5th grand slam of the season in the 7th inning on August 14 vs. Montgomery. The Generals lead the Southern League in grand slams with 2 coming from Morla, 2 from Ji-Man Choi and 1 from Brad Miller. • TAYLOR HAVING A GREAT AUGUST: INF Chris Taylor is batting .345 (30×87) with 16 runs scored, 3 doubles, 1 triple, 6 RBI, 10 walks and 7 stolen bases in 22 games in August. • DOUBLEHEADER BLUES: The Generals lead the Southern League having played 18 doubleheaders this season and are 12-14 in 7-inning games. • TRIPLES ADDING UP: OF James Jones recorded his league-leading 10th triple on July 24th in Chattanooga. He is 1 triple away from tying the franchise record. Jones is tied with Richard Lewis (10, ‘04) and Chris Walker (10, ‘06). Dwaine Bacon (11, ‘04) and Bo Porter (11. ‘98) are leaders. As a team the Generals have 39 triples which is 2nd-most in the Southern League. • WE GOTCHA!! Jackson catchers lead the SL catching 51.6% of base stealers (63 CS, 122 Att). The next closest is Pensacola which is throwing out 34.7% of base stealers. • SEATTLE GENERALS:…there are currently (8) players on the Seattle Mariners roster that were a member of the 2012 Jackson Generals (RHP Carter Capps, RHP Brandon Maurer, INF Nick Franklin, INF Brad Miller C Jesus Sucre (15-day DL), C Mike Zunino (15-day DL) RHP Yoervis Medina and RHP Stephen Pryor (60-day DL). In total, (9) 2012 Generals have made their MLB debuts and (4) 2013 Generals. (C Brandon Bantz, RHP Hector Noesi, INF Brad Miller, RHP Erasmo Ramirez).